Photo courtesy of Philly.com and Rob Tornoe. It’s a message Philadelphia 76ers loyalists have held on to for years: it’s all part of the plan. To be a fan of one of the NBA teams with the most abysmally embarrassing performance records has not been easy in recent years. The team hasn’t made the playoffs in more than 15 years and only pulled out 10 wins all of last season for crying out loud. Add to that the unwavering regional support for local sports teams, and you’ve got a group of “die hards” who are starving for a championship. The wait has been too much for some, but for those that have persevered, for those who have trusted the process, it could start to pay off. The plan to tank in an effort to rebuild a quality team by essentially rigging the draft is finally starting to come together. Thanks to first-round draft picks like Joel Embiid, Dario Saric, and Ben Simmons, former General Manager Sam Hinkie’s mantra to “trust the process” is taking shape. And with it comes a lesson applicable to any business. Whether you’re a graphic designer just starting out your own freelance practice or just earned partner at a prominent law firm in a major metropolitan city, the lesson is the same. 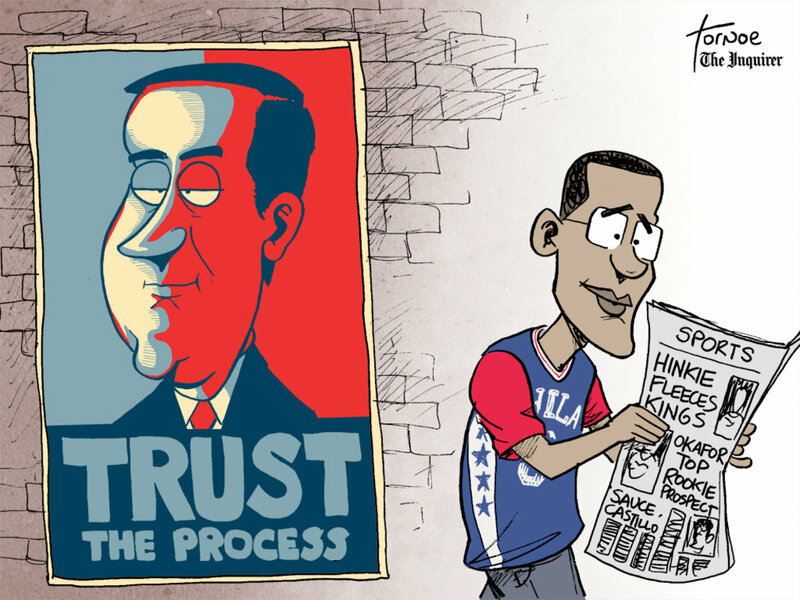 For Hinkie and his former team, that process has had its fair share of growing pains. It wasn’t easy. And it didn’t please everyone. But it seems to be working. Just peep the crowd at Wells Fargo going nuts over Joel Embiid, aka “The Process”, and his performance against the Toronto Raptors. 76ers fans couldn’t stop chanting “Trust the Process” tonight. How exactly does all of this apply to business? We all start somewhere. Living in mediocrity is sometimes a necessary step on the path to success. How long you stay there is ultimately up to you and depends greatly on the plan you’ve put into place. Have a plan. Businesses that have a strategic plan are twice as likely to be successful as those without. It doesn’t have to be fancy, and it may not be easy, but putting together a plan is the first step toward making it a reality. Persevere. Chances are you aren’t going to please everyone with the decisions you make. You may even upset people along the way. But it is never more important than in those moments to stick to the plan. To persevere. To trust the process. Jim Collins, who was a Stanford professor at the time, interviewed Jim Stockdale, a prisoner of war in North Vietnam and Medal of Honor recipient, during the research for Good to Great, which was published in 2001. He read the autobiographical In Love and War, written by Stockdale and Stockdale’s wife, before the meeting and wondered how Stockdale had found the courage to survive. While being a prisoner of war is exceedingly more severe than being a prisoner of awful basketball, the message is consistent. The common thread that ties most successful businesses together is they all made that leap after experiencing some kind of challenge. They all encountered hurdles along the way, but in the end they came out ahead. They trusted the process and now they reap the rewards.